Join us in the cafe on the ground floor of the Medical Education Building to celebrate the launch of the annual Internal Giving Campaign. Participating employees of the University of Hawaiʻi John A. Burns School of Medicine (JABSOM) donate a portion of their salaries to invest in the programs and missions the medical school provides for students and the community. 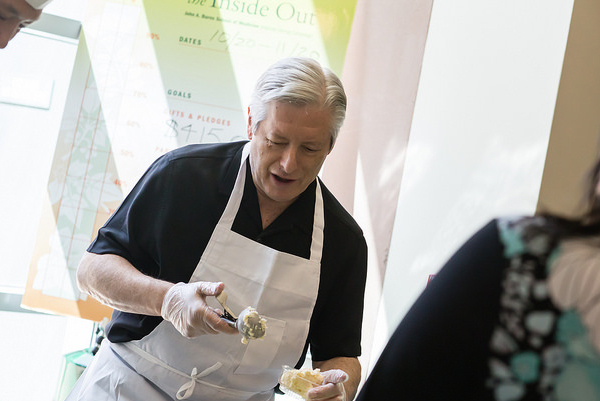 Dean Hedges and the IGC 2018 Campaign Co-Chairs will be scooping up the ice cream for you, and all the sides you need to build your own Sundae will be provided. At JABSOM, philanthropy begins in the center of the circle: family first. Here we believe that if we are asking others to give, our ‘ohana should be the first to give. Each fall for the past ten years, JABSOM has conducted an internal giving campaign – Starting From the Inside Out – that asks faculty and staff to provide financial support for the school. To date, you have donated over $3 million dollars to support the projects and programs at JABSOM that matter most to you. Mahalo! Year after year, a majority of us who work at JABSOM – from the Dean to the janitor – demonstrate that those who know the school best believe in its mission and support it with our personal philanthropy. As always, we encourage you to support an area of the school that is meaningful to you. We will continue to offer matching funds to encourage participation and increase the value of your gift. The campaign runs from October 19 – November 19, but gifts received on or before October 26 are eligible for the maximum in matching funds. Please consider making your gift today.